The Kinlochroag Highland Fold and their owner and breeder, Finlay Macdonald, are under threat. 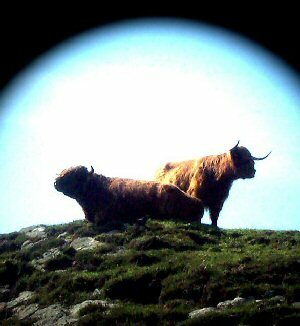 This famous Fold of Highland Cattle that feature in www.highland-coos.com are fit and healthy and an asset to the rough moorland they inhabit. But due to the ancient nightmare that has plagued Scotland there is a chance that some of the fold may have to be dispersed. 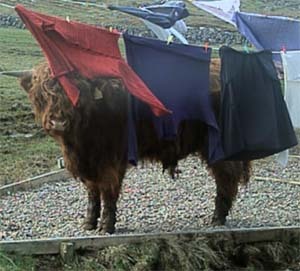 In some cases this may not be possible, the alternative for those gentle highlanders is too horrendous to contemplate. This isn't dramatisation of a cause this is fact. A battle is on to save The Kinlochroag Fold, a battle that Finlay will fight to its conclusion. What are his options? Eighty years on - you have two weeks to get out! Financially for Finlay this is a no win situation, expensive to fight and if he loses it means culling his cattle, capitulate, get kicked off and the result for these magnificent animals is the same. 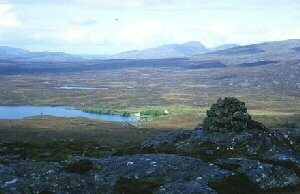 Finlay Macdonald's family have openly and peaceably been grazing livestock on an area of the 16,000 acre Morsgail Estate for Eighty Years. Now due to the aggressive demands of the current owner, a Suffolk businessman who bought the estate twenty years ago, the open-ness and peace has ended and legal action looms. There are a number of estates on the island, most bolster isolated communities by offering employment and encouraging tourism thereby boosting the island economy. Morsgail used to be one of these, an asset to the community but the current owner changed that. Now Morsgail is 16000 acres of neglected land, neglected wildlife and neglected opportunity. The Laird (who lives in Suffolk) has never employed a local person since taking over the estate twenty years ago. He regards himself as a conservationist, but conservation at Morsgail comes in the form of neglect. He has done nothing to conserve anything, although the original listed building managed to burn down under his care. This was replaced with a large modern house. 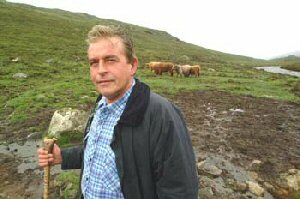 However it is the recent move to elicit a grazing contract from Finlay that has led to the threat to Finlay's fold of highland cattle and his sheep. The Suffolk Laird despite his claims of being a 'decent chap' has already employed a firm of very expensive solicitors and raised an action in the Court of Session in Edinburgh. The cost of this could be born by Finlay should the case go against him, which is a huge threat in itself. Taking out an advert in the local paper this Suffolk Laird claims to want Finlay to have free grazing but the 'licences' he offered included a "right of pre-emption" over Finlay's own land. In other words, had Finlay signed the licence, the Laird could (after a year) put Finlay off the land. If that forced Finlay into selling his own land, he would then have to give the Laird first refusal. Amazing what comes out in the wash! There is a rumour that approximately 9 acres of land have been registered by the Laird as an "agricultural holding" entitled Kinlochroag, coincidentally the same name as an old house on Finlay's land, which also happens to be an agricultural holding and is 9 acres? One of the Folds two bulls Cathach 6th of Killochries at two years old his future threatened. Finlay's solicitors advised against signing away his rights. Eventually after a slightly amended agreement which was equally unjust Finlay was given two weeks notice to remove his animals from the land. When he didn't comply he was issued with a summons to attend the Court of Session in Edinburgh. There has not yet been a hearing.